Jennifer Allen and her husband live in Portsmouth, Ohio, and recently bought a vacation home near Santa Fe. She went into their local Ohio bank, which also has branch offices in New Mexico, to wire their homeowner’s association fee to Los Alamos National Bank. The teller asked her where the bank was located. 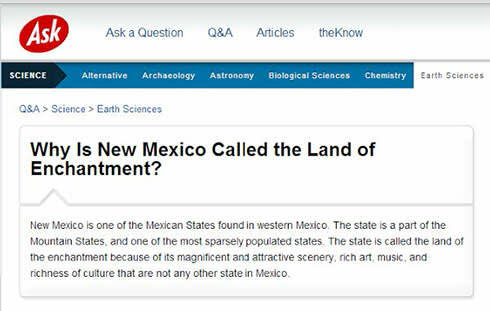 When Allen told her that it was in New Mexico, she said, “Oh, that would be an international transfer.” Allen explained, “No, New Mexico is a state in the U.S.” The teller disputed that. Allen further clarified that it was located between Arizona and Texas, “and she just looked at me like I was crazy.” Finally, another teller corrected her and then took over the task. Dear “50” fans: Help sustain this popular feature by sharing anecdotes that you haven’t gotten around to sending in. Just dash it off if you like, and we’ll take it from there. Submissions will be edited for style and space. Please include your name, hometown, and state. E-mail to fifty@nmmagazine.com, or mail to Fifty, New Mexico Magazine, 495 Old Santa Fe Trail, Santa Fe, NM 87501.